In many countries, parliamentary deputies are replaced by new ones if they become government ministers. In most countries, they are replaced if they die. In Iraq, cabinets are big and the death rate high, meaning that there is a higher turnover of deputies during the parliamentary cycle than many other places. On Monday, the Iraqi parliament finally decided that one such replacement which had generated some considerable controversy – that of Thamir Ibrahim Zahir al-Assaf – was in fact valid. Several points regarding this decision are worthy of note. Firstly, in a sad testament to the inefficiency of the Iraqi parliament, the decision was finally taken on this matter some four months after the question of Assaf’s membership had first hit the agenda in March this year. The reason is that in order to consider a decision on “the correctness of the parliamentary membership”, as the Iraqi constitution puts it, the chamber needs to be at least two-thirds full so that the required supermajority decision can be made. With 247 deputies present, Monday was one of the few sessions this year with attendance levels over the two-thirds majority mark of 217. Most of the time, the Iraqi parliament is barely half full, with typical numbers of attendees just above the quorum level at 163. Second, the dispute about Assaf’s membership serves as an indicator about the extent to which the Iraqi parliament busies itself with useless issues. Assaf was confirmed as deputy, but it is really unclear why anyone felt they had the right to challenge him. So far, the main objections to parliamentary deputy replacement have related to moves that upset the balance of governorate representation (i.e. a deputy from a certain governorate are attempted replaced by someone from a different governorate), or the balance of parliamentary blocs is affected (the supreme court has indicated that replacements should come from the same parliamentary bloc as the deputy who left his or her seat). In this case, however, the deputy in question not only came from the same governorate as his predecessor (Anbar). He also ran on the same electoral ticket – the Unity of Iraq alliance. 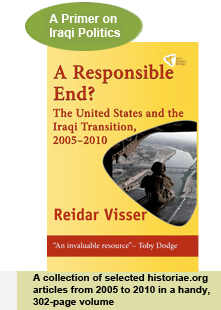 The Assaf case involves a remarkable chain of replacements in Anbar that began right after the formation of the second Maliki government in December 2010. When Sadun al-Dulaymi became a minister in that government, he was replaced by someone else from his list and governorate: Khalid Sulayman Hamud al-Fahdawi. Fahdawi was killed in September 2011 and was subsequently replaced by Ayfan Sadun al-Eisawi, also of the same governorate and list. Eisawi was then killed and shortly afterwards in January 2013 replaced by Assaf. A look at the original roll of candidates for the 2010 parliamentary elections shows all these four gentlemen on the same list running for seats in Anbar. It has been suggested that three or four figures played a leading role in the recent attempt to challenge Assaf’s parliamentary membership. The first was another Unity of Iraq candidate from Anbar that failed to win a seat, Tareq Khalaf al-Fahdawi. The second was a relative of one of the deceased and replaced candidates, Faris Taha al-Halbusi. The third was the former finance minister, Rafi al-Eisawi, with some suggesting he was aiming to ultimately get the seat for himself in order to achieve parliamentary immunity from prosecution. And the fourth was the parliament speaker, Usama al-Nujayfi, who reportedly used his influence at the parliament speakership to get the case on the agenda. It is perfectly conceivable that Halbusi thought he could make a claim to the seat based on a higher number of personal votes. This has been tried before, but as seen in other cases, the argument is judicially uninteresting. Personal votes are simply not relevant to the law on replacement of deputies. On the other hand, it is noteworthy that several deputies who in practice have stolen their seats since they replaced deputies from other governorates still retain their seats today because they are so well liked by their colleagues that no one has bothered to challenge them (or, that only a minority is interested in this). This includes National Alliance deputies Muhammad al-Hindawi and Jawad al-Shuhayli, as well as Salim al-Jibburi of Iraqiyya. Note also how the official list of parliament deputies deals inconsistently with this issue: It has seamlessly made Hindawi and Shuhayli deputies of Baghdad (they ran in Dahuk and Karbala), whereas Jibburi is still listed as Diyala representative, meaning Salahaddin has one less seat than the 12 mandated by IHEC in the official seat distribution. Whatever the reasons may have been, the whole exercise of challenging the membership of Assaf was shown to be futile. Except for the potentially valuable effect of having sectarian fronts break up a little during a time of heightened sectarian polarization – Nujayfi may well lose some Sunni friends and Maliki may gain some as a result of the replacement dispute – these antics and personal squabbles are an affront to Iraqi voters who risked their lives to go to the polls in March 2010. If it is allowed to go on ad infinitum, it will degenerate into a second election inside the Iraqi parliament where narrow clique squabbles among political elites rather than voter preferences decide. It is to be hoped that petty considerations of this nature will not prevail when the Iraqi parliament now turns to the far more important project of determining changes to the electoral law before the next round of parliamentary elections in 2014. This entry was posted on Tuesday, 9 July 2013 18:01 at 18:01	and is filed under Iraq parliament membership. You can follow any responses to this entry through the RSS 2.0 feed. Both comments and pings are currently closed. Looks in Iraq every bit of democracy different, as they will invented new style of democracy!! The most important point is Iraq having ill dysfunctional president for the last 6 months, still hold his post, no one in parliament voiced to get rid of a president holding his post from intensive care room in hospital in Germany? First: the Sainte-Laguë method for Voting system which is applied in Iraq many wrote some in favour some against. Today in news Ibrahim Javari accuses the system old, obsolete and its not workable for Iraq in 21 century? اكد رئيس التحالف الوطني العراقي ابراهيم الجعفري السبت ان قانون /سانت ليغو/ الانتخابي كان موضع اتفاق وكان ضعيفاً وأدّى إلى نتائج غير طيّبة وغير جيِّدة وهو نظام قديم مضى عليه أكثر من 100 سنة استُخدِم ليعالج قضايا مُعيِّنة في دول مُنيَت بأمراض سياسية فهو لا يُواكِب عصرنا أو لا يُطابِق وضعنا في العراق. Ibrahim Javari dislike Sainte-Laguë method for Voting system which came and applied in Sweden and Norway and he make big fuzz about it by saying its obsolete and not working in Iraq? What’s your thought about very recent call from Maliki to bar top officials from dual citizenship? What changes /affects will be on the seats and other part of political structure? Under the proposed law, ministers, MPs, governors, ambassadors and security officers would have to choose between giving up their second citizenship or leaving their post, Ali Mussawi said. Mussawi said the law was to enact a provision of the Iraqi constitution. Article 18 of the constitution says Iraqis can hold dual citizenship, but not those who have senior positions. Well, this is a long debate going back many years. The cabinet can probably send this law to parliament safe in the knowledge it will never be adopted thanks to the widespread practice among Iraqi political elites of having dual citizenship. I see it as an empty gesture.